Please let us know which dates you are interested in so we can get back to you. 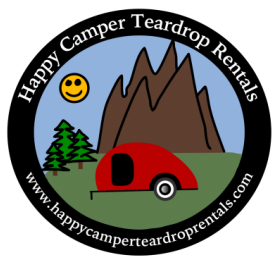 Your Happy Camper trailer rental is perfect for a California Redwoods road trip! You can even get some wine tasting in and perhaps pick up a bottle or two to enjoy at your campsite! Stop at Anderson Valley for a bit of tasting and your wine then travel on through the Avenue of the Giants, stopping for a night or two at one of the great campgrounds along the way. Take a walk through these majestic trees as there are lots of trails! Travel on to Prairie Creek Redwoods for a night or two. It's one of Northern California's best campgrounds! Watch the Roosevelt Elk in the meadow right there! Check out Gold Bluffs Beach and cross the stream to take a walk through Fern Canyon!